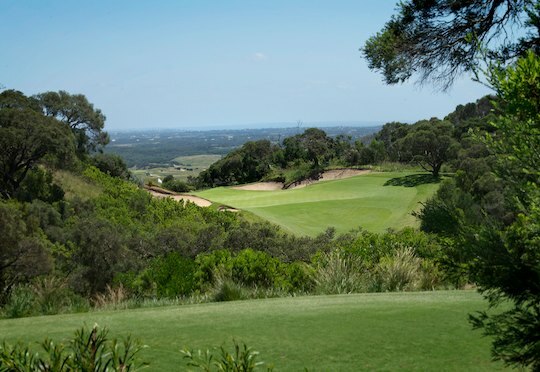 The southern coastal strip of the Mornington Peninsula, south of Melbourne in Victoria, is home to some of the best golf landscape Australia has to offer. From most of the high points at Robert Trent Jones Jr’s Old Course at The National Golf Club, the crumpled links terrain can be seen for miles into the distance, hugging the coastline of Bass Strait. 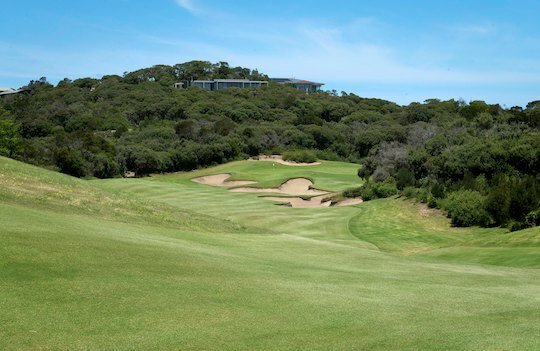 The names of the some of the golf clubs on the Peninsula – Moonah Links, The Dunes and Portsea – provide a clear indication of the type of golf to expect long before you arrive. The sprawling The National Golf Club is bucking the worrying modern trend of declining membership numbers, enjoying a huge membership of over 2500, with over 70% of those residents of Melbourne a little over an hour to the north. 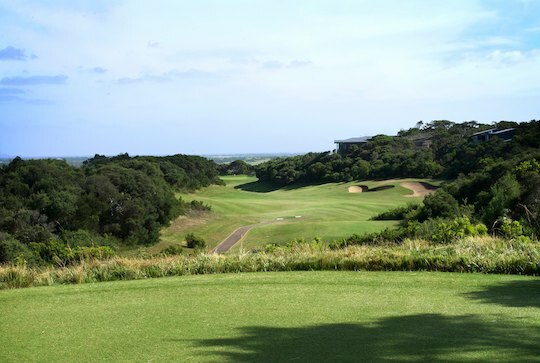 Since the Old Course opened in 1987, the club have opened two further world class layouts – Thomson, Wolveridge, Perrett’s Ocean Course and Greg Norman’s Moonah Course – both of which lay on the more traditional links-like land on the flatter parts of the property to the west. 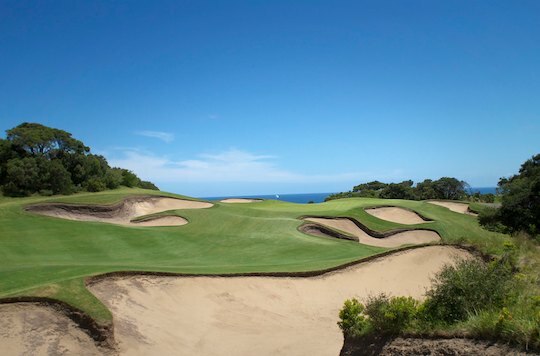 In a perfect example of ‘if you build it, they will come’, all three golf courses are well established in the Top 50 ranked courses in Australia and many thousands of rounds of golf are played there annually. The tract of land that American architect Robert Trent Jones Jr was provided to build The Old Course at The National, is perhaps the most scenic and has the most dramatic variety of elevation changes. His creation is a testament not only to the land but the skill and imagination of the architect. Trent Jones Jr was hired for the job apparently on the back of his work at Perth’s Joondalup Resort golf course, which also features some equally stunning and unique landscapes. The terrain at the Old Course is similar to that of the New South Wales Golf Club in Sydney and the design elements are similar, the holes routed to take advantage of valleys and gullies between sand dunes, from which you play through, along, across and on some holes, all three! Like the NSW club and a lot of other coastal golf land in Australia, the Moonah tree, a form of melaleuca or tea tree, is prevalent at The National and some of these gnarled, twisted varieties come into play from as early as the 1st hole, where a single Moonah tree splits the landing area in two. Another striking similarity to the NSW club is that a large part of the Old Course’s character is determined by the weather conditions of the day. Being on the windy coast, you can play some holes one day with a wedge approach shot that might not be reachable the next. The picturesque short par three 7th hole is a perfect illustration of the tempestuous nature of the elements in these parts. The hole plays to 139m from the very back tee across a valley of unplayable scrub with magnificent views over the bay in the background. On the day I played, with no breeze, it was a soft 9 iron but tales of long irons and woods into the teeth of a gale abound. Trent Jones Jr has ensured that the golf course is playable for players of all levels and caters for a number of strategies to play the course depending on the conditions. Opportunities to attack some of the par 5s exist for the longer hitters but stray off line and a lost ball is almost assured. What is consistent about the Old Course are the wonderful views and spectacular driving holes that exist. The 2nd hole is one such hole from the elevated tee to an inviting fairway, pinched in at the right with deep bunkers and tee tree to the left. The tea tree narrows as you approach the elevated green which features a steep slope and deep bunker in front, providing options to run the ball on or fly the ball to the green. The 8th hole runs in a similar direction with the scenery potentially distracting you from the challenge of hitting downhill to a blind fairway, which then arches left to right uphill, the fairway split into various levels as it progresses up the side of a hill to the well bunkered green. At 473 metres, the hole is so much fun to play irrespective of whether you are in a position to attack it or choose to plot it carefully as a 3 shotter! The par three 13th hole from the tee reminds me visually in some ways of the green complex at Royal Melbourne West’s 5th hole, albeit the National version is considerably longer at 198m, and the 14th hole is more Monterey Peninsula than Mornington, with the sweeping downhill tee shot on this par four culminating in an approach between mature Cypress trees. The undulating putting surface is part of a mammoth double green shared with the 10th hole. The final four holes are a fitting finale to this exciting golf course, starting with a medium par four that entices you to cut the corner from an elevated tee to set up a short pitch and possible birdie chance. The 16th hole is a lovely hole where the contours of the land have been brilliantly used by the architect. The approach to this par 3 can be semi-blind over the corner of a dune to the left hand pin position; in fact, there is more room to the left than appears to be the case from the tee with the natural slope of the land likely to kick the ball back to the putting surface. Another tee shot from an elevated position at the 17th offers spectacular ocean views, where a lot of ‘hang time’ can be achieved with a driver to the valley below. The great views don’t stop there on this sharp right to left dogleg par 5. The outstanding views continue once around the dogleg with fairway bunkers and three tiered green set into a dune providing a mouth watering challenge. I really love the 18th hole for its tight tee shot through a chute to a fairway that then bends to the right for a short approach to another spectacular and undulating green complex. Impressive deep bunkering menaces left and right against the backdrop of an azure blue ocean and skyline. The fact that the hole plays to a maximum of only 337m does not mean this a pushover in any way but played correctly, a satisfying finish to the round is assured. It is a matter of taste and personal opinion as to which of The National Golf Club’s golf courses is the best. 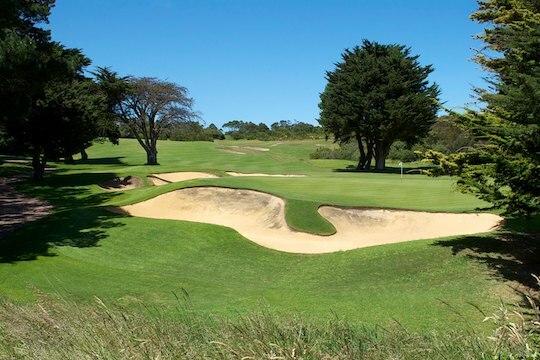 Each of them features a different grass type on the fairways and greens, the Old’s Santa Ana Couch a different strand to the Moonah Course’s Legends Couch, for example. No matter your individual preference, the course options and conditions available at The National are impressive with the terrain and vistas available on the Old providing that added something extra. Many luxurious homes are dotted around the elevated areas surrounding the Old Course, taking in those irresistible views but also designed to be protected from the vagaries of nature. 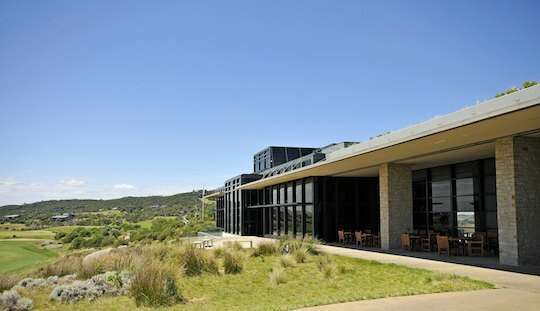 The enormous clubhouse that services players on all three courses is of a similar, low slung design but maximises the views over the golf courses and ocean beyond. To his credit, Jones Jr used the land superbly well, achieving a routing of holes that play differently every day and without having had the need to move too much earth in the process. To that end, he succeeded in creating a very enjoyable and challenging golf course that will certainly stand the test of time.